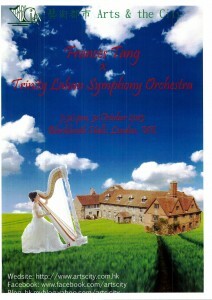 Renowned British conductor Howard Williams conducts the Trinity Laban Symphony Orchestra in an exciting programme of music with an English theme. Celebrating Britten’s centenary year, the Orchestra will open the concert with his popular Sinfonia da Requiem. Delius’ work offers a succession of variations on the original English Folk song ‘Brigg Fair’, before culminating in a joyous finale. Elgar’s Enigma Variations, with its rich harmonies and sweeping melodies, will captivate concert goers, with many recognising the familiar ‘Nimrod’ theme. Finally, the evening offers a new composition by Trinity Laban’s own Andreas Papapetrou, certain to engage listeners and emphasise his presence as an exciting new voice on London’s new music scene. Please note a booking fee of £1.50 per transaction applies for phone and internet bookings. Melissa Calusio and Frances Tang are going to have a harp performance at the chapel of the Chinese university of Hong Kong. 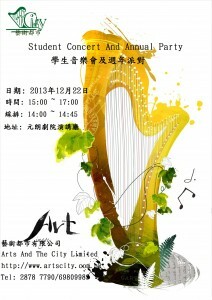 Let’s come and enjoy Xmas music by harp! Arts and the city limited will have a Harp Concert in the Hong Kong Baptist University on 30th October,2013. 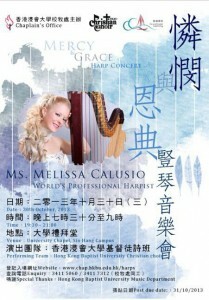 The Performer-Melissa Calusio.